Mary Whyte sitting in front of a recent painting from her "Working South" series. Seabrooker Mary Whyte didn’t know what she was getting into during a recent visit to Greenville, South Carolina. While working on the portrait of a local bank president, she heard that a nearby textile mill was shutting down. The person who told her the news sadly shrugged their shoulders and said, “It was going to happen anyway. That profession will be gone in ten years.” That one comment caused the wheels in Mary’s head to begin turning furiously and within a short period of time, she was whisking across the South, gathering the men and women of America’s dying professions and capturing them in watercolor. Her portfolio for the series, aptly entitled “Working South”, is haunting. The full sized paintings are set to be on display in the Greenville Museum in 2011, but the eight by eleven images of her major works tell stories that no writer could put in words. There’s the bent old woman, her wiry white hair knotted in a tight bun, holding the corner of a king sized quilt hanging from the wall behind her. Her hands are starkly detailed, the blue and purple veins crisscrossing the bones under a paper thin layer of mottled skin. Her late husband’s wedding ring was sown into that blanket, said Mary, as she looked at the portrait. Another shows a jovial round woman with a colorful sweatshirt standing behind the counter of one of the last herring smokehouses in the country. Mary pointed at the tip jar sitting slightly askew on top of the freezer display case. “I loved the character of that jar,” she smiled, pointing at the tears and smudges on the “tips” label which she’d incorporated into the painting. A detailed dollar bill lay in solidarity in the bottom of the jar. On this day, however, Mary Whyte was preparing to ship a painting to the Greenville Museum for the “Working South” series. It’s a large piece, with a faded quality reminiscent of heat and late summer/early fall in the South. In it, a troop of elderly African-American musicians are working their way through a crumbling graveyard underneath the bent, moss-covered limbs of a giant Banyan tree. The painting, said Mary, is of one of the last funeral bands in New Orleans. “They marched two by two into the cemetery playing gospel music,” she said. And in order to capture the moment just right, she had them circle her time and again as she painted furiously on her canvas. Mary Whyte, known for her mastery of the painting medium watercolor, is to be the subject of CBS television’s “Sunday Morning” in early September. “Sunday Morning” is a news magazine program, airing from 9am – 10:30am EST on Sunday mornings on the local CBS affiliate. The show actually follows Whyte as she works on the New Orleans funeral painting for the Working South series. Other subjects portrayed in Whyte’s series include cotton pickers, boat builders, textile mill workers, crabbers, the shoe shine man, and shrimpers. Traveling the South for three and a half years, Whyte has taken the unseen and given them a face we cannot easily forget. The specific date of the episode will be posted at www.colemanfineart.com as soon as it is made available. For more information, please contact Coleman Fine Art 853-7000. Mary Whyte is an artist, author and teacher. 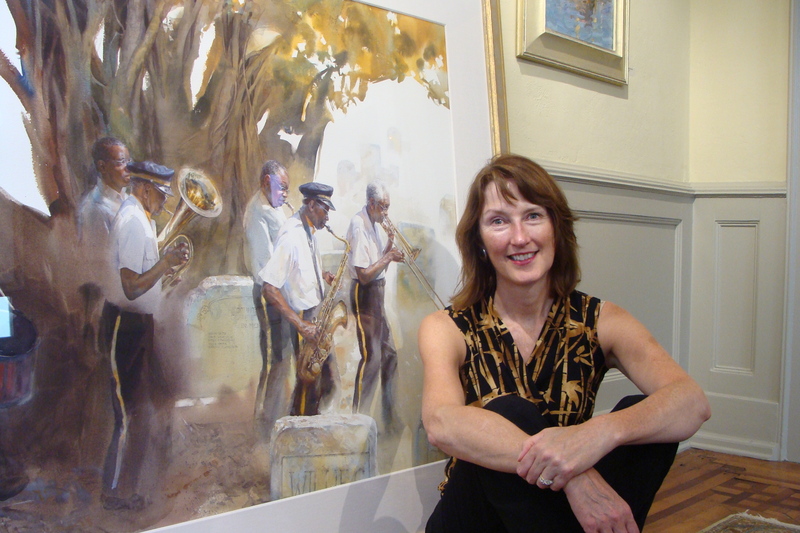 She is nationally recognized for her figurative watercolor paintings of the rural people of South Carolina. Whyte’s paintings have been exhibited in the nation’s most prestigious shows, and her work hangs in numerous private and museum collections. Mary has been recently featured in the magazines International Artist, American Artist, and at the Portrait Society of American conference in Washington, DC. This September she will be featured in the premier European watercolor magazine Art de L’Aquarelle.